A66ARWRNKH2N Smart offer another unli chat bundle, this time your favorite LINE app gets a dedicated promo. 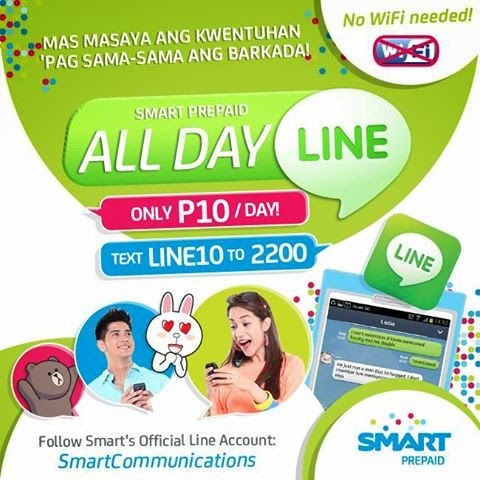 Enjoy unlimited chat with your friends and barkada’s all day for only 10 pesos good for one day. No Wi-Fi needed to use this app as long as it is installed on your smartphone you can use this promo. To those who don’t have this app on their phone you can download LINE for free at Google Play (Android) and Apple Store (iOS). Please be reminded that downloading this app may incur regular browsing rate if you’re not registered to your network unlimited internet browsing promo. How to register and use unli LINE chat? After texting the code, wait for the confirmation message from Smart confirming that you are already registered to this chat promo. To use other IM unli chat messaging app you can visit here.